A couple of years ago, I asked my neighbor Ken to make a window box for me. As is always the case, Ken did a bang up job. 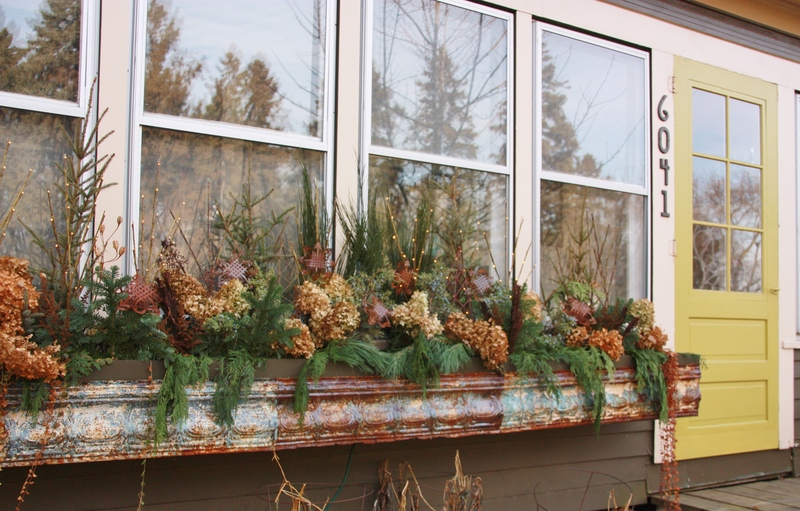 I had already purchased some old tin crown molding that I knew I wanted on the front of it. I also had some plastic rectangular planter boxes that I wanted to fit inside. Ken took some measurements, and voila, created a window box. It’s kinda huge. But one of my biggest decorating rules is ‘go big, or go home’, also known as ‘never do anything half way’. I wanted it to be the full length of my front porch windows. However, it can be a bit expensive to fill up. I consider it the ‘focal point’ of my front yard though, so it’s a priority to make it look fab for summer and winter. Originally the tin had a coat of white paint. Despite numerous clear coats every spring, the paint continues to flake off, first leaving that lovely shade of blue, and then just the rust. Since I pretty much love anything rusty, I consider this a good thing. To fill ‘er up without breaking the bank, in winter I use stuff from the garden. Mostly hydrangeas, but there are some other things tucked in there as well. Some seed pods, and even some dried Astilbe. To make it pretty at night, I’ve added twig lights that can be found at Target. 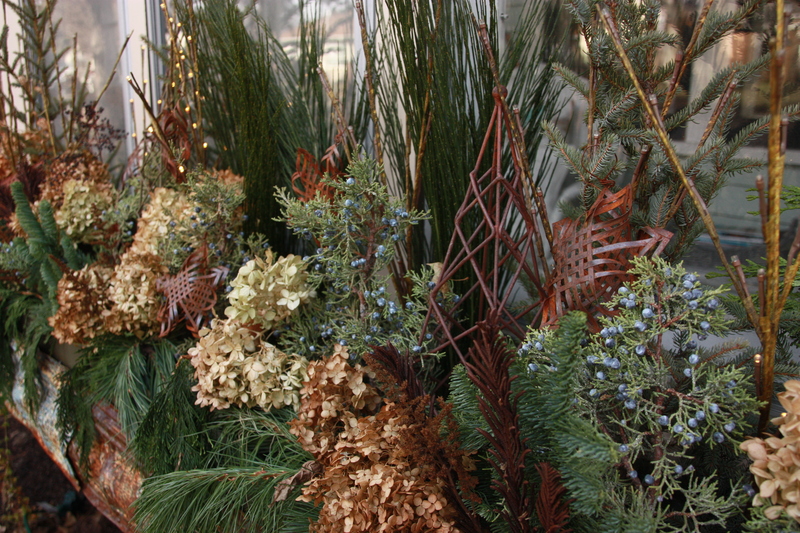 I also include some fab rusty metal ornaments that work perfectly with the rusty tin. As you can see, I don’t really go for a traditional Christmas look with reds and greens, or silver and gold. I want something that’s going to look good for the entire winter … and here in Minnesota that means it has to last a good long time. It won’t be long now before the window box has a couple feet of snow under it. Dare I admit that I am looking forward to it?